Gifts from the Pirates: "Reading is a basic tool in the living of a good life." Last week Seth came out of school very excited, he had moved up to stage 10 in his reading and it was definitely cause for celebration. 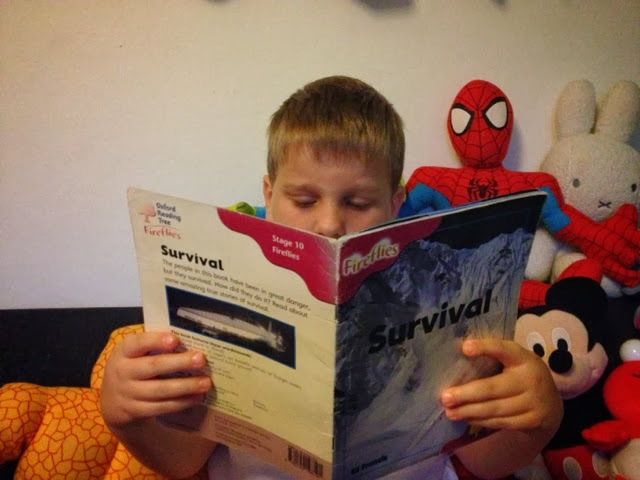 His reading has come on so well since being at school and he is so much more confident and fluent with his words. We're so proud of the way he is developing. What's great is how much he enjoys reading, I was the same when I was younger, I loved the Enid Blyton books (and of course comics). Sometimes if Seth wakes up early he just grabs a book off his shelf and quietly reads (I like a bit of quiet reading time myself too).